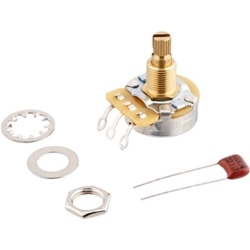 For repair, replacement, or restoration with high-quality Fender form and function, choose from Fender's wide selection of OEM electronics â€” like this 500K split-shaft potentiometer. It is custom-designed for use on nearly all US- and Mexico-made Fender instruments with split-shaft potentiometers, and it includes a mounting nut, washer, and modern 0.022mf 250-volt capacitor. Sweetwater Fender players know that for the right look and fit, and for historically reliable performance, genuine Fender parts are the way to go.